Japantown San Francisco is a concentrated area of Japanese culture in San Francisco dominated by shops and restaurants where you could spend a few hours or stay overnight. Japanese settlement began in this part of San Francisco after the 1906 earthquake forced locals to move out of residences in Chinatown and south of Market Street. Settling in the area called the Western Addition, they built churches and shrines, and soon the neighborhood's Japanese shops and restaurants became a miniature Ginza known as Nihonmachi or Japantown. San Francisco's Japantown offers unique cultural opportunities. In fact, it's one of only three official Japantowns in the continental United States (the others are Little Tokyo in Los Angeles and Japantown in San Jose). If you enjoy shopping for unusual things, you'll find plenty of them in any one of the Japantown shops. You might come home with Hello Kitty-themed fingernails, a cast iron teapot, all the supplies you need to make an ikebana flower arrangement or a Daruma wishing doll. San Francisco weather is best in April and October, but most any time is fine, especially since many of its attractions are indoors. It's extra festive, lively, and fun during the annual events such as the Cherry Blossom Festival, Japan Day Festival, and many others. Take a tour: San Francisco City Guides offers free walking tours of Japantown, an excellent way to learn more about the place. Go to the movies: Although there are plenty of other exciting activities, a visit to the AMC Kabuki Theatre offers an extraordinarily pleasant film-going experience that's far beyond your local multiplex. Get relaxed: Kabuki Hot Springs & Spa offers a rare opportunity to experience a Japanese-style bath, a very relaxing process that comes with an incredibly reasonable price tag. They also offer massages and other spa services at a good price. Go shopping: Shops in Japantown Center offer a wide range of Japanese products, including books, ikebana flower-arranging supplies, and housewares. Pika-Pika is always a hit with the girls, who like to use the Japanese photo booths to make silly stickers and photo stamps. Daiso is also a fun shopping stop. Think of it as a Japanese bargain shop, where you can find all kinds of fun and kitschy stuff for very affordable prices. Be entertained: For something more cutting edge, New People at 1746 Post Street is a three-story, entertainment complex that promotes the latest Japanese popular culture as expressed through film, art, and fashion. 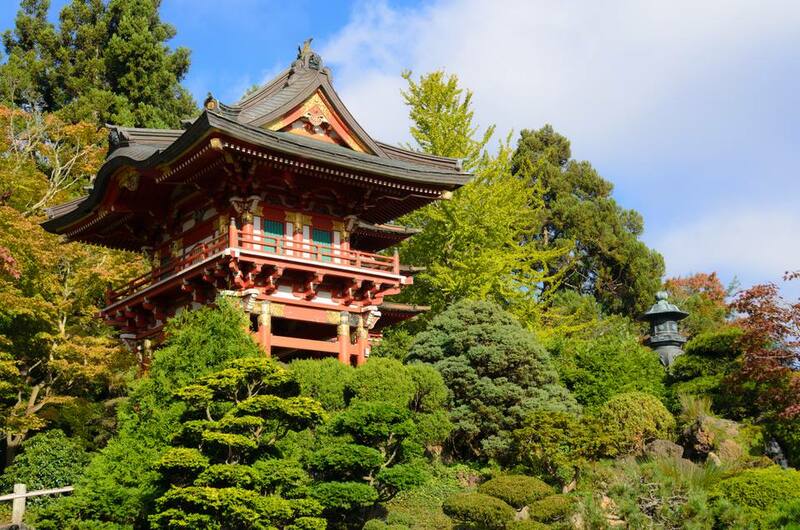 Explore Japanese culture: Japanese Tea Garden in Golden Gate Park is made up of small garden areas and features beautiful buildings, waterfalls, and sculptures. Japanese walking food tour: If you'd like someone to introduce you to food from local eateries in Japantown, try Gourmet Walks' Japantown Tour. The 3-hour walking tour begins at Fillmore Center and ends at Buchanan Street Mall near Peace Plaza. Sample Japanese mochi, and other food. April: The Cherry Blossom Festival celebration includes a chance to enjoy Japanese food, watch cultural and martial arts performances, listen to live bands, and see the Grand Parade. July: Japan Day Festival is a family-friendly event that features performances in taiko, martial arts, koto and more. August: The Nihonmachi Street Fair features music on two stages, food, and handmade artisan crafts. September: J-Pop is held at the Fort Mason Center but is well worth checking out for the latest Japanese music, fashion, film, art, games, tech-innovations, anime, and food. If you want to stay with the Japanese theme, the Hotel Kabuki offers a laid-back, traditional Japanese style experience, with deep soaking tubs and sliding panel walls. Also nearby is the Kimpton Buchanan, and there are plenty of cheap but good places to stay. Where Is San Francisco Japantown? Japantown San Francisco is located west of San Francisco's Union Square, just off Geary Boulevard at Fillmore Street. One of the best things about Japantown San Francisco is that you can get there by public transportation. You can also park your car in the Japantown Center Garage and leave it there until you're ready to go home.